“I’m taking you to the best seafood restaurant on the island of Sicily, maybe the entire world!” Roberto proclaimed. 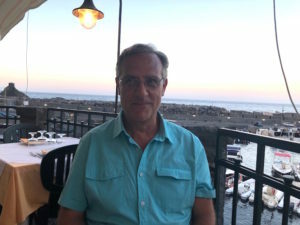 Roberto’s insistence that EVERYTHING in Sicily is the best is irritating at times. How can the food be better than the meals I’d eaten in southern France, Tuscany and Puglia, my favorite places for food adventures? I was anxious to find out. 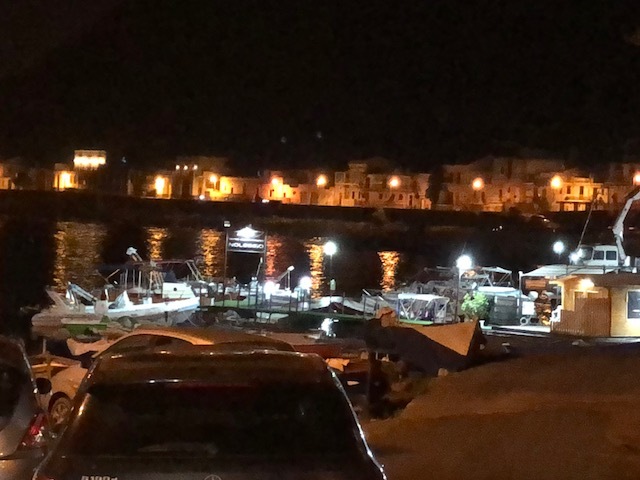 We drive north from Catania, for about 30 minutes, through narrow, winding neighborhood streets that hug the coastline to arrive in the tiny paese (village) of Santa Maria La Scala. Santa Maria La Scala sits cradled in a storybook harbor, overlooking a tranquil Ionian Sea. Houses colored ochre, pistachio, melon and granite perch on volcanic rock facing small, bobbing fishing boats. Trattoria Scalo Grande’s location is its decoration. Simple pumpkin colored tablecloths, trimmed in white, and black chairs to match the railing keep the focus on the food. The sun is setting as we sit down at an outdoor table hovering over the harbor. The view is enchanting. The warm breeze invites me to relax into the Sicilian vibe. I glance at the menu but defer to Roberto to order the crudo I’d so anticipated. “Vino?” our waiter states more than asks. “Si! 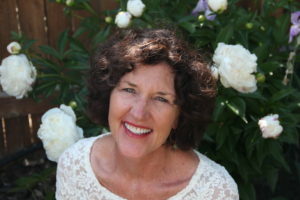 Vino Bianco Locale,” I respond. The wine comes in a recycled green bottle, is cool and delicious. 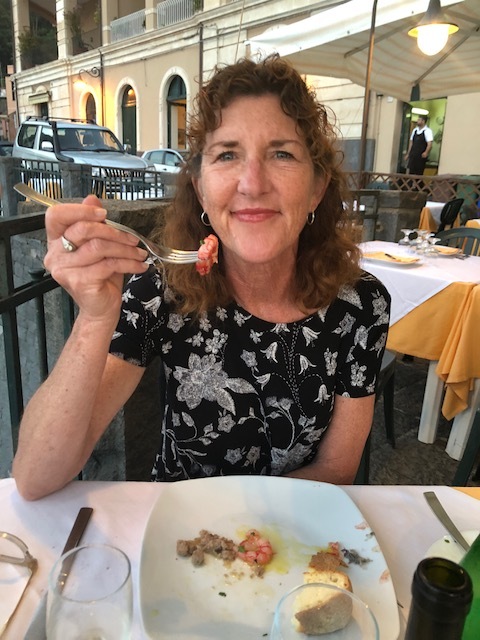 We’ve mostly been drinking white wine on this vacation – weather driven – and its crispness pairs beautifully with the fish and lighter pasta dishes. The Sicilians fill their tumbler glasses a quarter full and drink slowly unlike their food which they inhale like its their last meal. Loving every minute of this dinner. Roberto, my guide in all things culinary in Sicily. 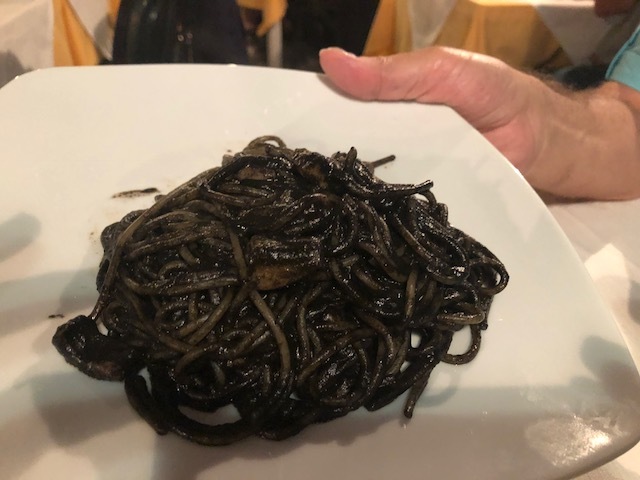 For our secondi, or second course, Roberto orders the sepia pasta made with squid ink and I decide to select my fish from the assortment displayed on ice inside the restaurant. 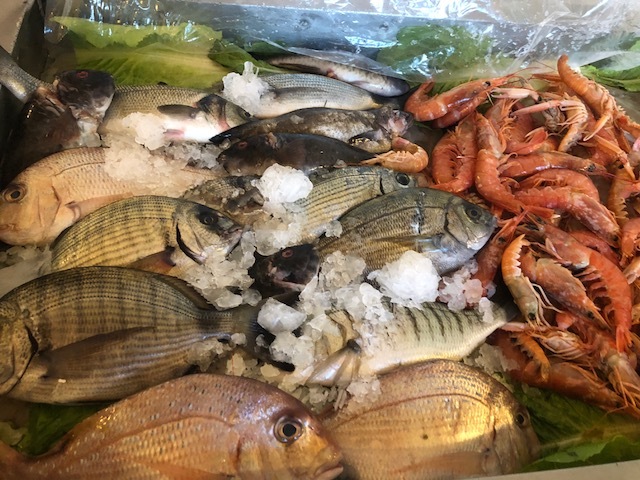 The fish is priced by the kilo, so it depends on what you order. 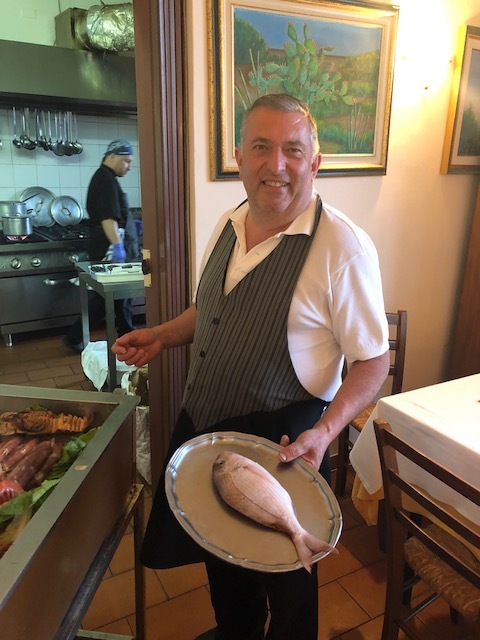 The waiter describes the fish using words like “forte,” strong and “pesce a polpa tenera,” soft flesh fish. A chubby “Pauro,” or seabream species, catches my eye. He will be grilled whole with no adornments except olive oil, lemon juice and fresh parsley. Take your pick! It’s all good. 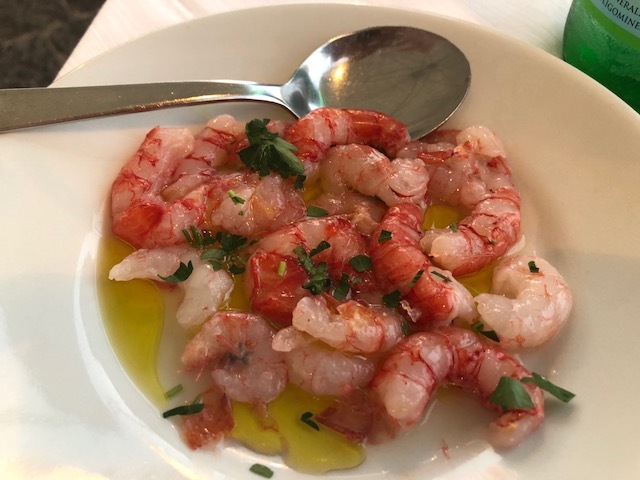 Sicilian crudo red shrimp. Fantastico! I’m not sure how I feel about anchovies. In the U.S., they usually are oily, fishy and not fresh. But, these are different. They gleam. 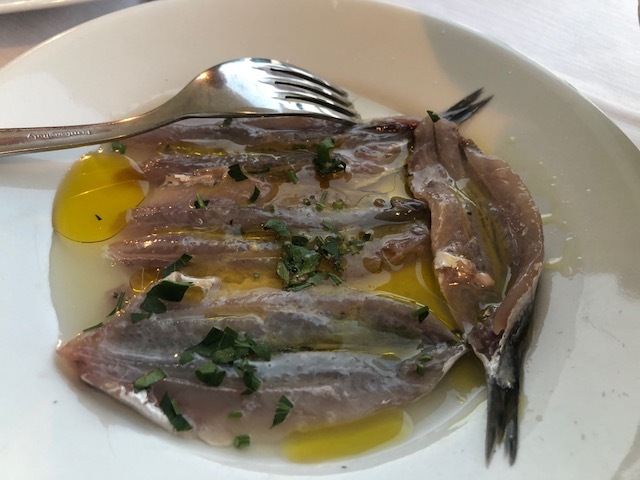 Butterflied to expose their delicate bodies, and dressed with the same olive oil, lemon juice and parsley, their briny and tender taste is bewitching. Aren’t these the most beautiful anchovies you’ve ever seen? Small chunks of warm tuna follow, then a delectable mixture of marinated octopus, shrimp and mussels. 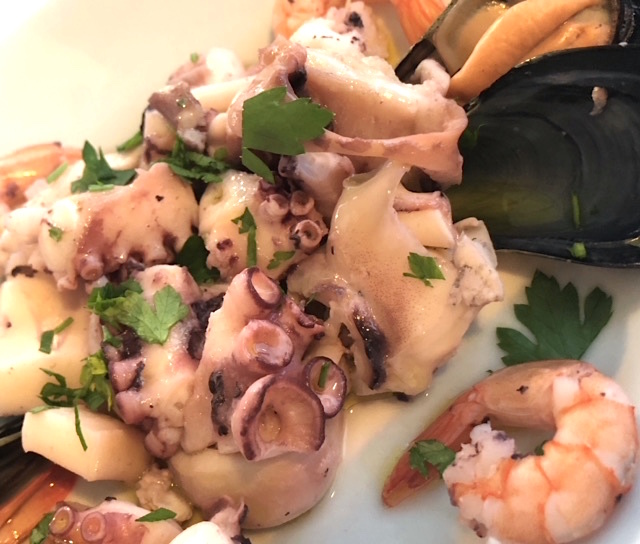 The parade of seafood continues. 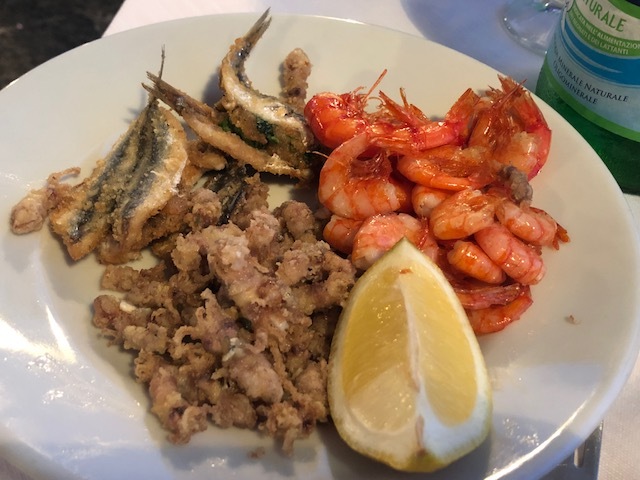 A plate arrives with a trio of perfectly fried anchovies, shrimp and calamari. A squeeze of fresh lemon brings out even more flavor in these crispy bites. Freshly steamed mussels, heaping in a bowl, are placed between us. I eagerly grab one and with a fork, pry out the orange meat. 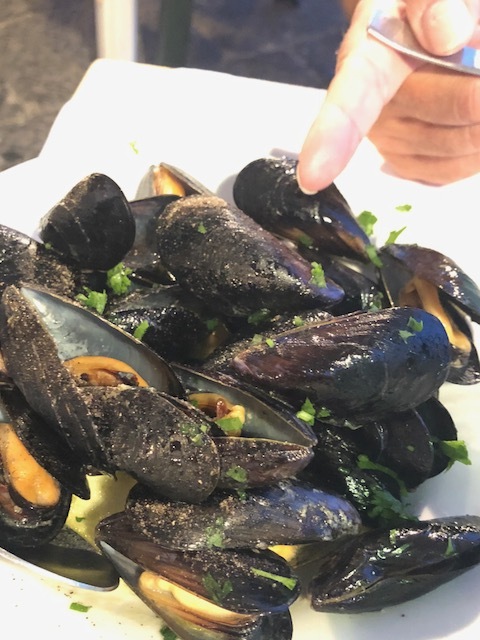 The subtle taste of wine and garlic accents the mussel’s tender bite. I eat in amazement as I have never eaten a mussel that has no chewiness or after taste. I’m all about texture as well as taste and these are simply the best mussels I have ever eaten. I smile at Roberto, in a fog from all the delectable flavors that have crossed our table, and nod my head. 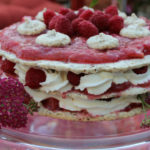 “Yes, Roberto, you are right about everything being fresher, tastier and better in Sicily.” Now there is no denying it. The best mussels I have ever eaten! 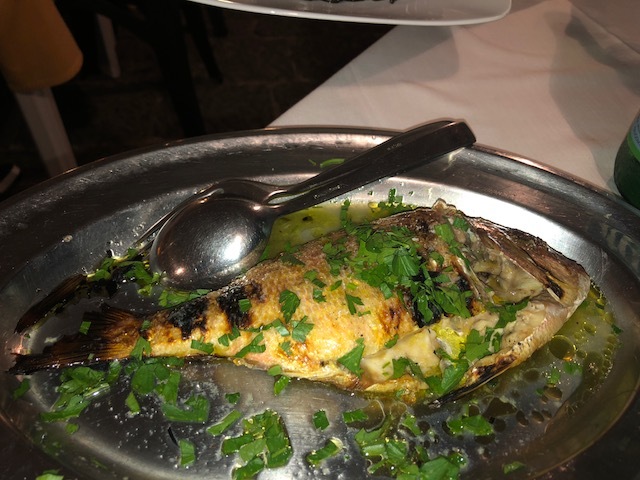 My secondi of Pauro fish is served on an oval platter, laying in a pool of the ubiquitous garnish of olive oil, lemon juice and parsley. He is gorgeous! I expose the inner flesh and easily slide my fork under the set of bones to unlock them and set them aside. 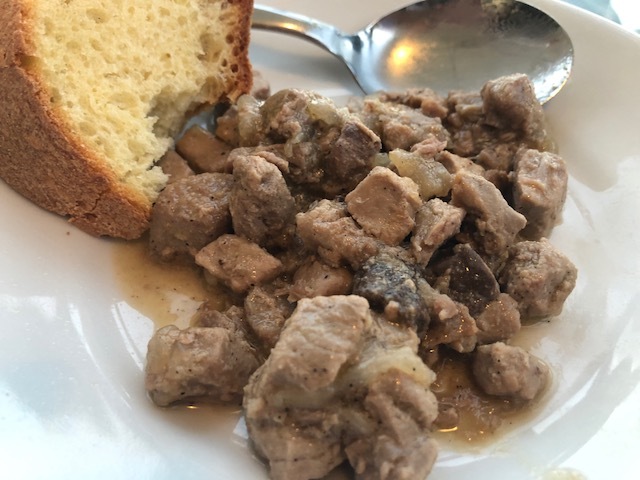 The Pauro’s meat is delicate, moist and divine with a spoonful of the sauce. Roberto is just as entranced with his squid ink pasta. Words simply cannot describe this meal. For dessert, I opt for a digestive of lemon sorbetto. I taste a combination of lemon and key lime. Asking the waiter what kind of lemon it is, he replies, “locale,” or local. The different parts of the island deliver their own unique fruit flavors. I eat the cool, slushy sorbetto slowly, savoring every spoonful. 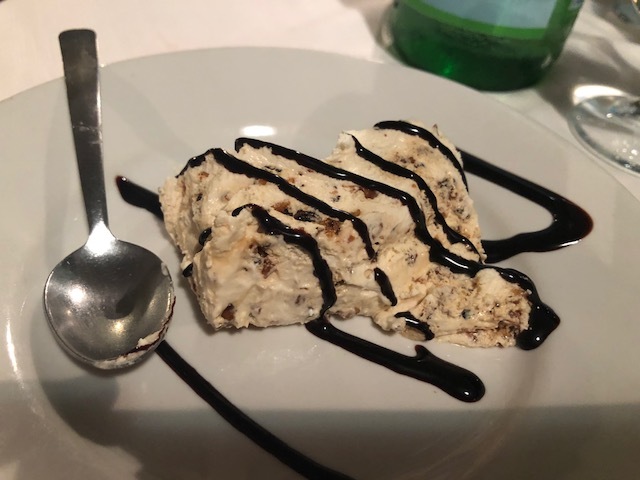 Roberto’s mandorle (almond) semi-freddo drizzled with chocolate sauce is heavenly too. It melts in your mouth, is not too sweet and is just the perfect few bites to finish off the meal. I could never duplicate this meal, this dessert. It is only meant for this place in time. An experience more than just a dinner. It will be etched in my memory forever… the warm ocean air, beautiful views, setting sun illuminating the city lights. Bellissimo!